The 10 Best Public Golf Courses in Oklahoma! Whether you’re a weekend duffer or a more experienced golfer, you’ll find some excellent golf courses in Oklahoma where you can take in nature. 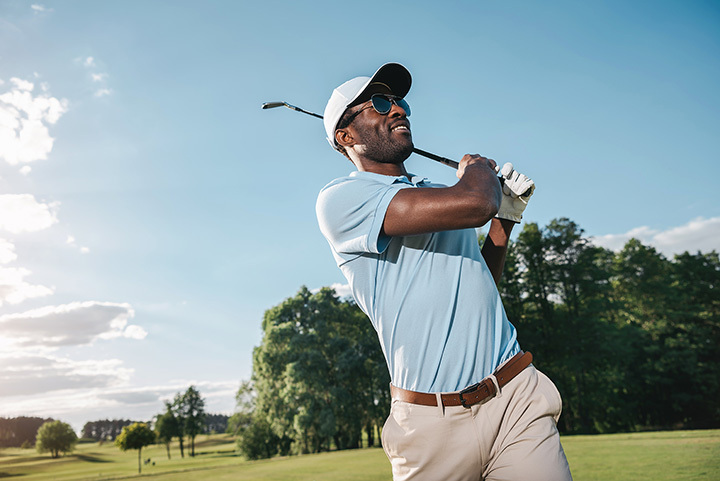 From Oklahoma City to Catoosa, you’ll find a golf club or golf course to suit your level of skill. Now get outside and tee up! Chickasaw Pointe has been ranked as the third best golf course in Oklahoma since its opening. The green fee is just $50 on weekdays during the summer season. It’s a par 72 course with four sets of tees to give golfers of all skill levels a chance to challenge themselves. Forest Ridge is an unrestricted golf course with an upscale atmosphere that typically you would only find at members-only courses. Golf Digest ranks the course with 4.5 stars. It’s a beautiful course in the Tulsa metro for golfers of any skill level. Randy Hackenkemper designed this course in northern Oklahoma City. There are four creeks which wind through the property, making it a challenge for some players, but the course is championship level. It’s set on 170 acres and is beautifully maintained for one of the best golfing experiences in Oklahoma. Cherokee Hills was originally designed by Perry Maxwell in 1924, making it one of the oldest courses in the state. It’s been redesigned since those early days to make it more challenging for today’s golfer, whether you play every day or just on the weekends. It’s been said that you might catch a glimpse of a bald eagle in this golf course carved out amid pine, hickory and oak trees. Ken Farley designed the course in 1974, and although the fairways are narrow, beginners and experts will find this course challenging and relaxing. Karsten Creek Golf Club is a top-rated golf course across the board. Make sure to check the calendar for closing dates, because it does host many tournaments. It’s home to the Oklahoma State men’s and women’s golf programs, and it’s a challenging course to keep team members at their best. Oklahoma City maintains many golf courses, but the Lake Hefner course is one of the best. The North Course has a rating of 73.8 and was designed by Randy Heckenkemper. The South Course is rated 70.5 and was designed by Floyd Farley. This golf course is the University of Oklahoma facility, and features 7,380 yards of golf over rolling hills and native grasses. It has five sets of tees, allowing beginners and pros to be challenged when they come out. You’ll find four 18-hole championship courses at this club located just north of Oklahoma City. Duffy Martin is the founder and designer of the course, and it’s built around his philosophy, "People would rather hit 'em than hunt 'em. Life is too short to hunt for golf balls." This course is owned by the Peoria tribe of Oklahoma, but it’s public access with five sets of tees to give golfers of all levels a challenge. It hosts a number of tournaments each year, and it has great service.